When we decided to venture out on this journey, we had a large family of animals living with us at the time. At one point we had: two cats, two dogs, a gecko, four fish tanks (including one with a turtle), two snakes, a rabbit, and two birds. We were a full house while we were living in 1500 sq. ft. and we knew that was too much for our new 300 sq. ft. home. The hardest decision was determining who to bring with us. There were several animals that had been a part of our family for over a decade. After a lot of debating, we narrowed it down drastically (well, drastically for us). We found homes for our loved ones that we could not bring with us. 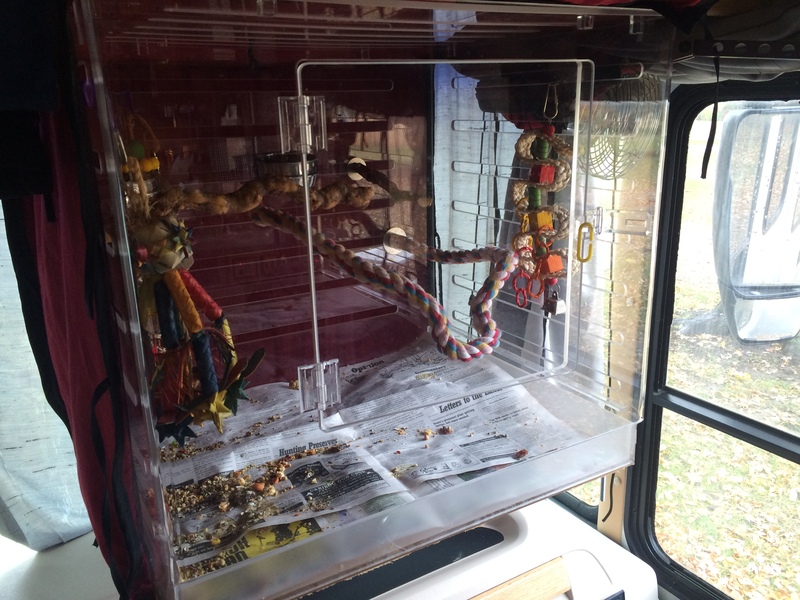 We thought we should introduce everyone to our “traveling zoo” and the members of our family who are keeping us company on the road! Piper is four years old. She was a foster with us until we decided we had to keep her. 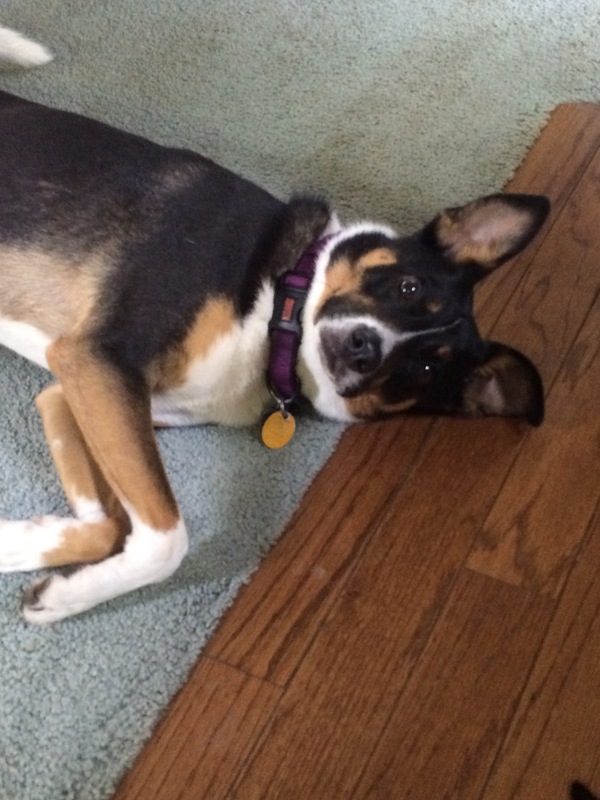 We are not sure what kind of dog she is but she is awesome! Piper is very intelligent, too intelligent for her own good. But she is amazing at tricks thanks to our friend Ali. She knows how to sit, lay down, play dead, shake, high five, back up, and almost get beer from the fridge. 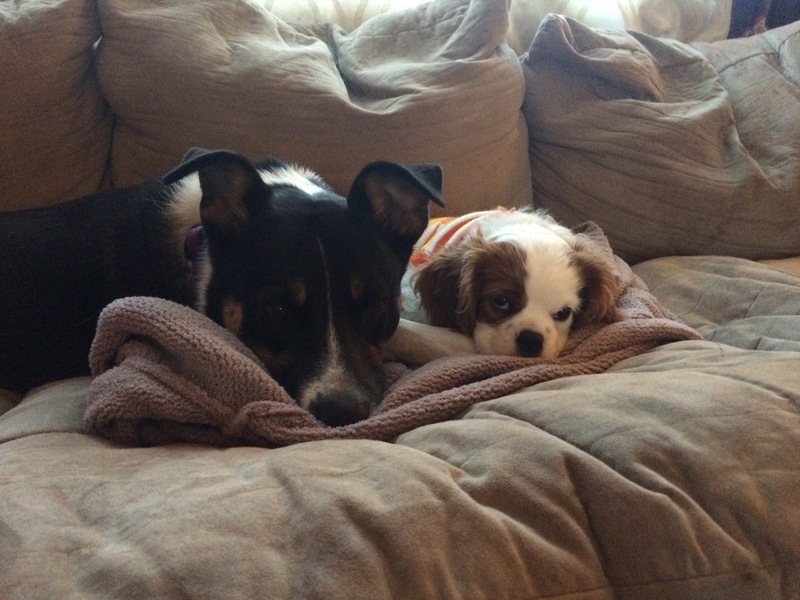 She is also a great big sister to the new addition to our family, Theo. Theo is the newest addition to our family and named after Theodore Roosevelt. 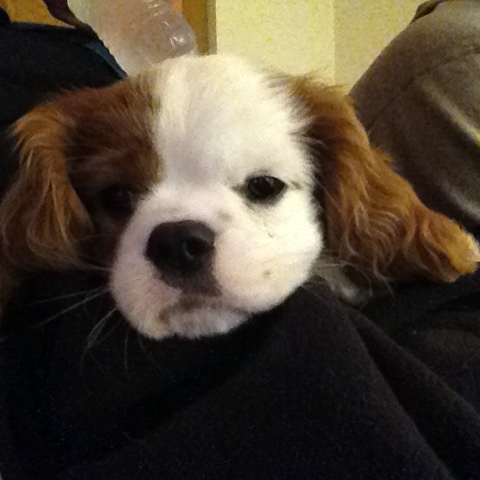 He is about 12 weeks old now and is a Cavalier King Charles Spaniel. He goes by such nicknames as Theo, Teddy, Teddy Rose, Teddy Westside, Theodorable (thanks Gina! ), T-dog, and Ted. His energy is zero to one hundred in a split second and keeps us moving all the time (we sleep when he sleeps). Lila is also four years old (D.O.B. July 31st like Harry Potter). She is the most amazing cat in existence we believe. She is really affectionate, comes when called, and is a great snuggler. 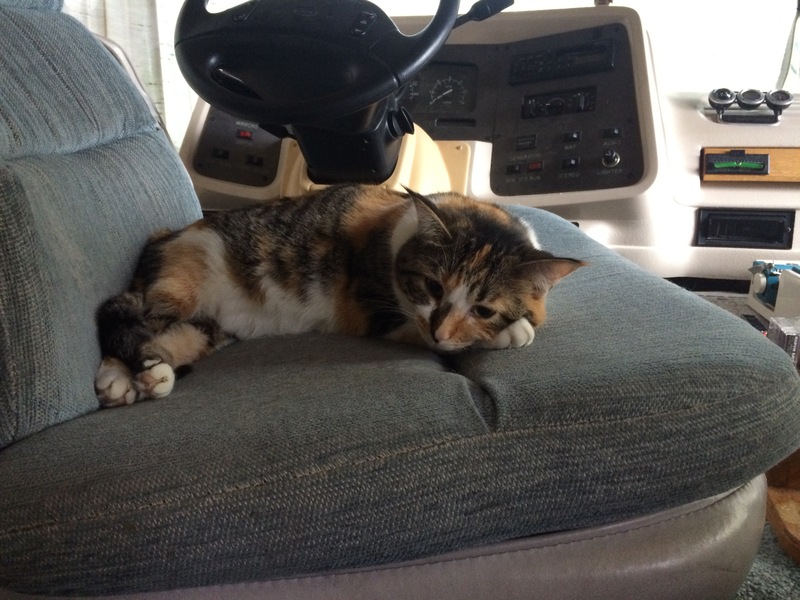 She doesn’t love when the RV is moving, however, so we are working on getting her adjusted. Named after the Beatles song “Eleanor Rigby,” Ellie is a true cat. Born a barn cat (a little over a year ago), she loves the outdoors. Next to the definition of “cat” in the dictionary is her picture because she does what she wants, when she wants and our only purpose is to feed her and clean her litter box. She will tolerate petting only when she seeks it out. However, she can be the sweetest thing and she and Lila love each other a lot. 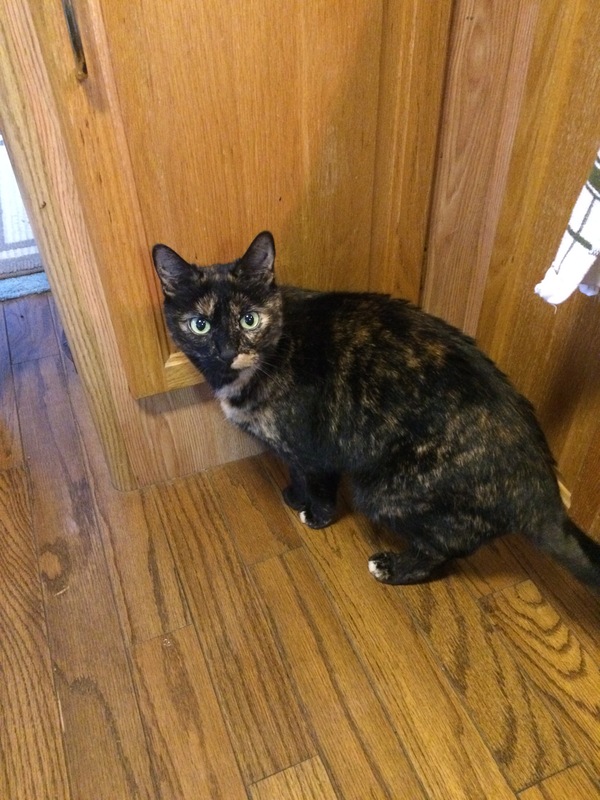 Plus, Lila really needs another cat in her life because otherwise she is super clingy. 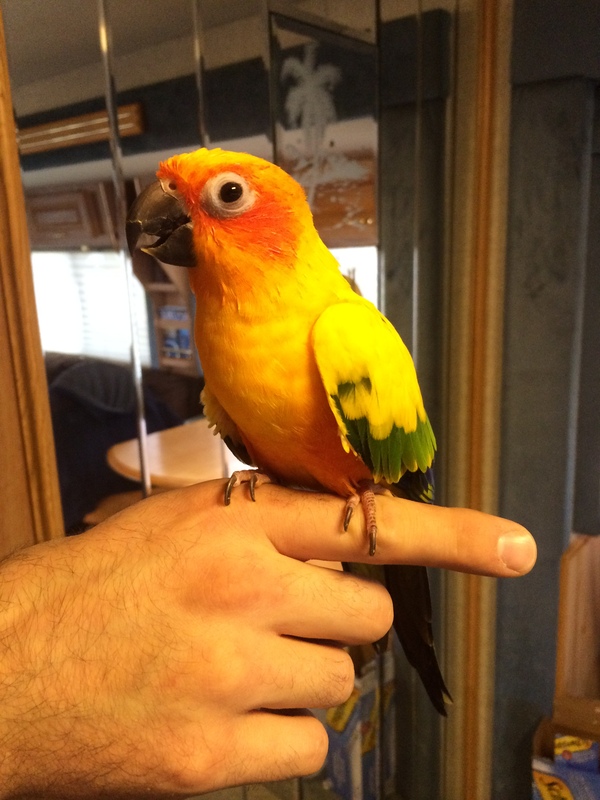 Pica (or Picasso) is a nine year old Sun Conure who has been with us since our first place together. We got her when she was a baby and hand fed and weaned her ourselves. We found out that she was a female last year when she laid eggs. Her previous cage mate, Mambo, found a wonderful home with a new family but we couldn’t part with Pica so we took her on the road with us! She lives in a beautiful acrylic cage that we mount near our front windshield while we are parked and that gets strapped to our dining room table while we are driving. She doesn’t speak but imitates us when we eat and when we crack our knuckles. She also does a great wolf-whistle. Sorry about the bad cage pic! Sebastian is our betta fish. 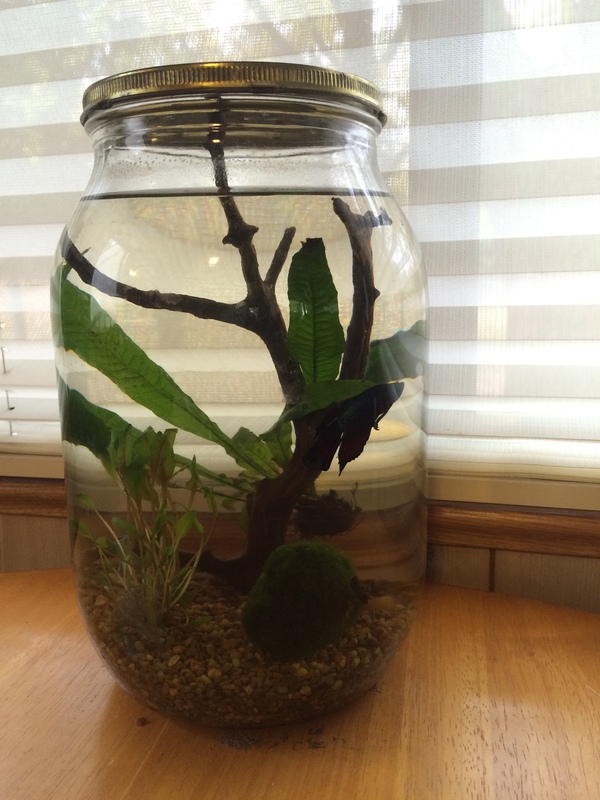 Both of us missed having a fish tank while living in the RV so we decided to set up a one gallon jar with live plants for a fish! We went with a jar so that the lid would be secure enough for traveling and to prevent the cats from getting in (don’t worry! we poked holes in the lid). It has been quite interesting traveling with a fish on the road so far. That concludes the tour of our family! I’m sure there will be more updates on how we are all getting along throughout our travels. Quite a family! Just getting caught up on the start of the journey. Jealous already!! Hi, we are planning to head out in an RV in September. I read your article in the startribune in May and it sparked the first thought. We have a dog and a parrot and my husband prefers to not bring the parrot. I’m not sure what I would do with him (the parrot – haha). We’ve had him for 25 years! Can you give me any insight into what it’s like to travel with a bird? I’m not worried about the dog, but the bird is challenging. Thank you so much! That’s exciting that your adventure is coming up so soon! I’d be happy to give you some insight. When I realized I couldn’t part with our bird, Pica, I started researching people who travel with their birds. The hardest part for us was figuring out her cage. She has been a wonderful travel companion. Obviously with the smaller space she sounds a little louder. She has adapted very well. Other than figuring out the cage, the only thing we really worry about is cooking is such a small space. We bought ceramic cookware and we make sure to ventilate well and keep her on the other side of the RV while we are doing so. Let me know if you have any specific questions! Feel free to email as well: thewanderingdolphin@gmail.com.